Serums are light-weight formulations that can be more concentrated with active ingredients to help visibly improve skin. There are a variety of products to choose from, but clinically proven Epionce Intense Defense Serum has been shown to work better for wrinkles compared to a leading growth factor serum. Let’s take a closer look at the study results below. The Epionce approach to skin care is to use a blend of botanical ingredients to provide the skin what it needs to look youthful and healthy without any irritation reactions or harsh side effects. One of the first questions that is asked, though, is how do we know the Epionce approach works? The answer: many of the Epionce products have been clinically tested against other market-leader products in head-to-head studies using the final formulations – and show a significant measurable benefit to the skin without the use of growth factors. One such study was against the leading growth factor serum in the premium, medical skin care industry. This study was performed by independent dermatologist investigators looking specifically for improvements in signs of aging. 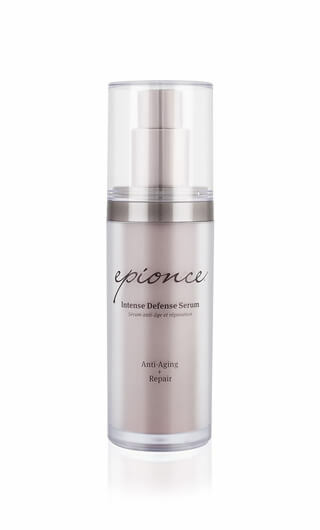 They discovered that Epionce Intense Defense Serum achieved much better results than the growth factor serum at weeks 1, 4 and 8 for most anti-aging parameters including roughness, texture, fine lines and wrinkles. By the end of the study, Intense Defense Serum had improved wrinkles by 57.1%, whereas the growth factor product had only improved wrinkles by 37.5%. Additionally, 78.6% of the panelists said they would buy Intense Defense Serum for their at-home regimen, whereby only 37.5% of the panelists said they would buy the growth factor serum. To learn how to incorporate Epionce into your regimen, talk to an Epionce skin care professional.